Go, Tracy, Go! : I am the champion! Okay, it wasn't that big of a deal after all. 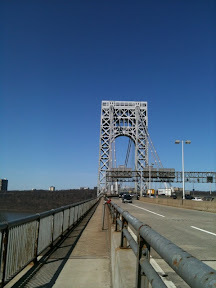 I ran the George Washington Bridge! The approach. It looks intimidating. Maybe because it's HUGE? 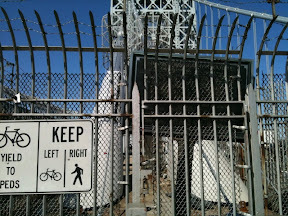 The Port Authority's website very clearly said that the north walkway was open today and the south walkway was closed. The Port Authority's website lied. 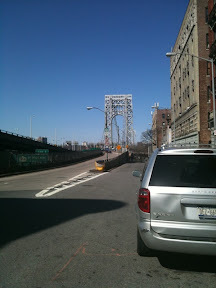 Incidentally, this photo is taken quite near the scene, during my first-ever drive across the GWB, where my sister pulled the car over in hysterics and IN TRAFFIC at the mouth of the bridge so that we could switch drivers because she was scared. 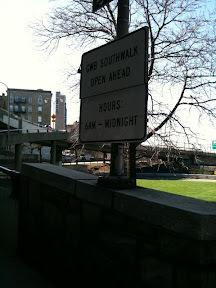 So, a slight backtrack and onto the south walkway. What you don't see in these photos are the cyclists. They were everywhere. So many of them. 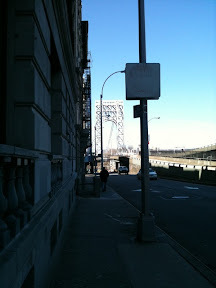 Go figure; it was a gorgeous day, and the GWB is the easiest (only?) 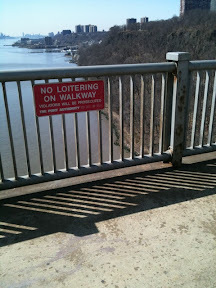 way to get from Manhattan to the Palisades in NJ. There is great riding to be had in the Palisades, or at least so I've heard. There is also a lot of spandex cycling gear to be seen, if today is any indication. It begins. .9m between the outer supports. 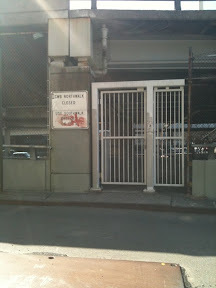 Note the beat up sign, inexplicably fenced in. We kept right. The New Jersey side. Having the disdain for Jersey that can only be held by someone who has spent much of her life living in either NYC or Philly, I was impressed by how pretty it was and I kind of wished I was running that dirt trail down by te water. And it was over! So quick and anti-climatic. I guess I forgot to cut my d-tag off after last week's race. 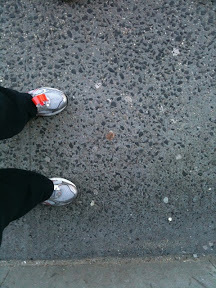 And I hate, hate that it's still pants weather even though it's nearly April. The views weren't as spectacular as I expected. The grade wasn't bad, either. In fact, it was barely noticeable. I haven't gotten the deets from the Garmin yet, but it was refreshing to be able to run somewhere flat and uninterrupted for 2m. Stupid! I made at least one typo. Apologies. This was posted from my iphone, so I can't easily edit it.